Short Run Labels – Brand your own Home Brew. Something out of the ordinary for us… Presentation boxes and short run labels for qualifiers of the Brisca F2 World Championship last weekend at the Mendips Raceway. An iconic raceway situated a stone’s throw from Cheddar, the home of the nation’s most beloved cheese! 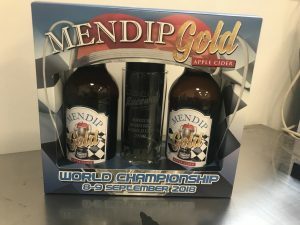 We were approached to create the branding, i.e labels and presentation box for the championship qualifiers – as the event was being held in Somerset they were all presented with a special edition ‘Mendip Gold’ cider(!) and an engraved glass. The two bottles and glass being different sizes ensured quite a challenge, but most important was finding a cost effective way of labelling the bottles. Just 80 bottle labels were required. So our Short Run packaging services became particularly useful for the client, being able to design print and deliver short run bottle labels worked perfectly. We have a lot of expertise in the field; producing short run labels for jams, wines, ciders, chutneys and more. The short run box was quite a task, but we are pleased with the result and our client was elated with the final product. Video – How the Labels are Made. The labels were cut to shape to enable a close fit to the bottles and we can cut inline to save on the cost of cutting forms etc. This makes them more cost effective for short run labels. 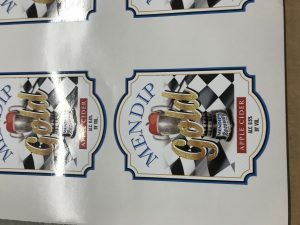 See below for a short video of the bottle labels in production. This is the last stage of the process – printing and cutting to shape. Something oddly satisfying watching the machine working it’s magic! How can I Start Labelling my Products? Very simple. Get in touch! Give us a call or request a quote using our online form. Whether you’re a keen home brewer who wants to be recognised for your effort. Or you’re a jam-producing prodigy flirting with the idea of getting your products to market. We offer the design and printing/packaging expertise that will have you heading in the right direction.